A relationship with a restaurant is a lot like one with your friends (or lovers) in real life. With some friends, years can pass, hairstyles can change, babies are born, but once you see them- it's like nothing has changed. The conversation is nonstop, laughter makes your cheeks hurt and you can't believe so many years have passed since you've first met. Those are the golden ones. A restaurant you can return to after years and still savor the same flavors and favorite dishes that made you first fall in love with the place. With other relationships, you might wonder what you did wrong to get the cold shoulder from your former BFF- awkward pauses in the conversation, having nothing in common anymore and feeling sadness realizing that somehow you've grown in different directions that can't be sustained by past experiences. I think these feelings for me are intensified since moving to Taipei- distance and time really magnifies those unbreakable friendships or the fact that people move on when you're gone and you can no longer connect with them. Happy Korean is now my former BFF and I'm really sad. I don't know when and I don't why, but my formerly favorite lunch spot for Korean food has changed owners. And the changes the new management has taken will definitely hurt its business. I stopped in for lunch yesterday, excited to grab a heaping bowl of bulgogi over rice and maybe some cold noodles and was surprised to find that the area that used to house a little play area for kids was gone. It now had the fridge for drinks and prep/storage area for the panchan. Then when we got the menu, it was about five wooden spoons with black sharpie writing on it, with Chinese on one side, English on the other. There was bulgogi, bimbimbap, ginseng chicken soup, a stirfried squid dish and a pork belly, with prices about NT$100 more than before per dish. I asked about the old menu and that's when we learned that Happy Korean had a new owner. I asked if the bulgogi was the same (otherwise I'd get the hard-to-mess-up bimbimbap in a stone bowl) and she said yes, but just not over rice. I think she said that they had the same chef, but now I'm doubtful. Our panchan came out quickly enough, but it was slightly different from previous experiences. Gone were the japchae glass noodles, instead some pickled radishes. Another customer came in seemed surprised by the new menu. When we got our food, I had a bad feeling because it didn't look the same. And it wasn't. It was slightly tougher as thicker slices. The entire time I was eating it, I lamented to my friend how I couldn't believe it. If I had been there for the first time, I might have thought the place was decent, but once you compare something average to something you loved, it can't hold up. I mourned the loss like it was a real relationship. The funniest thing is that today I got an unsolicited text from my friend. She went there for dinner yesterday while she didn't know I had stopped by for lunch on the same day. 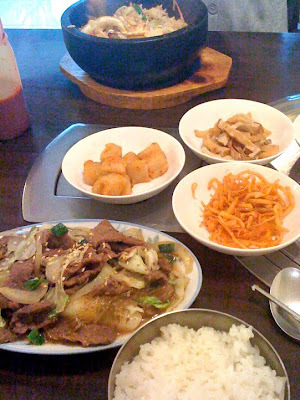 "I went to happy korean kitchen last night. apparently the owner has left and the food was terrible! only six items on the menu. i miss my cold noodle! :("
So I definitely can't strongly recommend Happy Korean anymore, but will be happy to hear if anyone has a different experience in the future. Anyone know of a new BFF who will serve us some cold naengmyun or galbi jjim? Have you ever went back to a favorite restaurant to discover it was gone or no longer the same? Check out Ari on Guangfu S. Road, Alley 280. No cold noodles but the best Korean food I've had in Taipei. Funny but tastes just like Korean food back in the states! Try telling the staff that Min sent you and see if you get any better service! Happy Korean was our "go to" Korean lunch spot near the office. But after going there after the management change, no one in the office goes there anymore -- very disappointing. Too bad... Happy Korean was on my list of places to get to, but perhaps now I won't bother. My favourite Korean place in Taipei is out in Tianmu; yes, they have cold noodles, and I've enjoyed them. I wouldn't say I'm a great judge of food, but I did live in Korea for a year. They definitely have a big menu. Details: No English name; Chinese name "濟州管韓國料理"
English address: Shidong Road #132. It's sort of kitty corner to the stadium, on the same corner as Mr Donut: you just walk past the Watson's and you're there. baby madison: i know!! but i found a new place! anonymous: ahh, glad to know i'm not alone. anonymous: if you lived in korea for a year, i'm sure you have a great judgement for authenticity!! i'll have to make a note for the next time in in Tienmu!